Is Nigeria’s Economic & Military Commitment to ECOWAS Stretched Too Thin? With standing Army of close to 200,000 men plus reserve, the Nigerian Army is without a doubt the biggest in SSA (Black Africa). With a GDP of $1.01 trillion (PPP) Nigeria is an economic behemoth, add that to a consumer market of 180 million industrious period you realise that West Africa is fortunate to have a country like Nigeria, the driver of economic growth in the region, with Nigerian investors investing billions of dollars annually in countries around the region. Enter the Nigerian military, the force for peace and stability in west Africa for decades. The expeditionary nature of the Nigerian military is exemplified by its fleet of Hercules C-130 and G-222 heavy lift aircraft. Nigeria operates the largest number of heavy lift aircraft in sub-saharan Africa, 3rd only to Egypt and Algeria. In the last two and half decades alone Nigeria have been deployed to 26 countries, more so than any other country in Africa. Nigerian troops have been sent to the roughest neighbourhoods in Africa where internal conflicts sometimes devolves into a frightening morass of combatants who are both ruthless, scrappy and barbaric in a scale almost beyond words. Places where children, sometimes under the age st of 15 are recruited and forced to fight. A conflict were civilians captured by warring factions from both sides are amputed just so they cannot be recruited into combat by the enemy in need of fighters. A place where pregnant women are disemboweled and their unborn foetus killed, carrying out acts of barbarity that invariable forces Nigeria to intervene twice to clean up the mess twice. They have been deployed to places far away from West Africa where large spending millions of dollars for the deployment of boots on the ground would not have made any strategic and economic sense. In fact its been a mantra for West African countries – just throw the Nigerian Army against it, they are the regional power and can afford it. But over time the operational tempo gets to a point where it’s not tenable, as was discovered in the Mali crises. The French have always viewed as Africans as stupid and gullible, but can we even blame them? All of a sudden France have developed a newfound concern for the Libyan people, and with the exception of South Africa, African leaders bought into this charade hook line and sinker. It was the same Robin Hood -Nicolas Sarkozi who only three years before welcomed Gadaffi the butcher with open arms during am extravagant 5 day working visit to France? What a colourful ceremony that was. On that beautiful day in December 2007, Gaddafi the butcher breezed into Paris in his Kingly Royal garment, accompanied by an entourage of 30 beautiful virgin bodyguards. After the French inspired bombardment of Libya what followed next was the catalyst for combat capable terrorist groups that continues to ravage Africa to this day. Libya is known to have one of the best armed military in Africa. As the country descended into chaos the Libyan armoury was looted in the full glare of the NATO alliance and nothing was done to stop it. The vast majority of these weapons went South. Weapons from surface to air missiles, artillery pieces, nerve agents, cluster munitions..you name it. Of the estimated 20,000 MANPAD (man portable anti-aircraft system) in the inventory of the Libyan army, only 5,000 of them were secured. Where did the rest go? SOUTH. Imagine the potential threar to civilian airliners with 15,000 MANPADS in the hands of various terrorist groups. Well guess what, it didn’t take long for the consequences to manifest. The Tuaregs, a Jihadi group that was only recently beaten to pulp and basically crushed and subdued made a spectacular comeback. In early 2012 the now well armed Tuareg rebels in a spectacular fashion swept the Malian army aside. Before the stunned Malian government could get its bearing northern Mali was under the control of the Tuareg rebels and started imposing Sharia law. Women were forced to wear headscarves, Smoking was banned,music was banned, alcohol was banned. A Malian army officer described being overrun by heavily armed rebels equipped just like the Libyan army , with heavy machine guns, anti-tank and anti-aircraft rockets. Tuareg officers serving in the Libyan army brought the weapons with them after the French engineered destruction of Gaddafi. The ECOWAS Chatter gives the Security arm of the regional body the mandate to intervene militarily in the event of an internal and external inspired conflict that threatens the stability of the region. Almost by default expectations is always on Nigeria to take the initiative for military intervention within weeks. When half of Mali fell under the control of Islamic militants, all eyes were trained on the Nigerian government . However a Nigeria bogged down the bloodiest and longest war since the Civil War, against Boko Haram, warned it needed more time because equipments will have to be drawn from combat units in Nigeria’s northeast. The Nigerian Defence Ministry stressing for time said deploying combat forces to Mali within weeks will stretch the Nigerian Army too thin, which already has forces deployed in Darfur Sudan.He further stressed that the sand dunes of northern Mali is vastly different from that of Nigeria and Nigerian troops don’t have the combat experience of such extreme conditions, neither does it have a way of keeping all that fine sand from ruining equipments. Facing a battle hardened enemy who live in those dunes is suicidal. There was no end to the badmouthing from ECOWAS member state thereafter. Ghanaian media ran stories on the “SHOCKING STATE OF THE NIGERIAN ARMY”, how it lacks the capability to fight on the frontline. A Ghanaian Ministry spokes person in an interview with the BBC said that a lack of discipline and training among Nigerian troops who are being heavily relied on by ECOWAS to oust the militants is becoming apparent. This coming from a country whose military contributions to the mission was to deploy cooks and truck drivers made it all the more ironic. ECOWAS member states were effectively calling on France to fill the void. We were bombarded with footage of Malians joyously welcoming the French and Chadian troops. It makes one recall similar scenes of Liberians happily waving the Nigerian flag joyously in Monrovia as Nigerian troops in their convoy drove through the capital. The humiliation of Nigeria by ECOWAS doesn’t end there. French and Malian reporters ran a story about the 870 soldiers contingent being poorly fed and near starvation, prompting the terribly embarrassed Nigerian government to hurry food to Nigerian troops in Mali, an even bigger embarrassment. I am not suggesting that the rapturous welcome received by France and Chad is wrong. I do not doubt the report of Nigerian troops going hungry and calling relatives to send them food. What I am concerned about is the glee by which ECOWAS member were embarrassing the Nigerian government before the world. Our immature neighbours fail to realise if Nigeria fails ECOWAS is as good as DEAD. Nigeria spent $10 Billion in operations in Liberia and S-Leon and asked for nothing in return. Those who took delight in seeing France upstage Nigeria as the guarantor of peace and security in the region fail to see the motive behind French action. It is too simplistic to believe the typical vague mix of promoting human rights and preventing the area becoming a base for attacks against the West banter. Give me a break !! Before the Mali invasion France had not won a single battle since the days of Napoleon. They were beaten in World War 1, soundly beaten in World War 2, they fled with their tails up in Vietnam. Many do not realise Vietnam was originally a French conflict. They created a mess and fled, leaving the Americans to clean up the mess. France’s only military conquests have been against poor African colonies where they plundered their resources. France desires to join the ranks of a global power. It recently reviewed its Defence Posture and a new Strategic Review, with emphasis on heavy armoured equipment, power projection assets and nuclear deterrence. It initiated discussions on the reduction of military dependence on the U.S. Going it alone in Mali and achieving victory will signal to the world that France is now the most powerful military power in Western Europe. West Africa contains some of the world’s largest deposits of uranium, gold, diamonds and oil, and France seeks to gain control over these resources. France uses nuclear power to generate electricity more than any other country on earth, and Mali and Niger contains some of the worlds largest untapped uranuim deposits. Until Now Paris had purchased these resources from desperately poor Niger and Mali, but with uranium hungry China’s increasing involvement and influence in the region, threatening the security of France’s uranuim supply, is bent on taking control of these resources. Lacking in military projection China has sought to use infrastructural and economic cooperation to gain access to these resources via establishing and partnering with the regions richest and most powerful country Nigeria. So while Chinese have sought control via economic influence, French missions in Mali seems to replicate those of the U.S in Afghanistan and Iraq. The formation of ECOWAS in Lagos on 28 May 1975 was the first breakthrough worldwide in efforts to institute some form if economic cooperating and integration embracing an entire region. An example for post war Europe to emulate. With a population in excess of 100 million Nigeria was naturally primed to be the leader. Nigeria’s economic strength has been the engine behind ECOWAS economic growth. Sixteen West African countries have free access to a market of 200 million consumers. The Nigerian Army likewise is the force for peace in the region. Rather that use her military, cultural and economic strength as a platform for regional hegemony, Nigeria has instead vigorously articulated and consistently defended the concerns and interests of its member States regardless of size. Nigeria spent $11 Billion to bring about peace and security in Liberia and S-Leone. To put it bluntly, Nigeria’s contribution towards peace and stability in Africa are unparelled . NIGERIANS are the warmest most generous and most hospitable people on Earth. Its inculcated in the cultural and a source of pride and this is reflective in Nigeria’s relationship with Africa. But this comes with a price. We forget other Africans might not necessary share the same values. We are naive and this has become costly. Nigeria contributes %70 of ECOWAS funding and %80 of its peacekeeping infrastructure, but what do we get out of it? The so-called free trade agreement gives a country like Liberia tax-free access to a trillion dollar economy (measured in PPP) and Nigeria access to a $12 Billion economy. Nigeria has effectively been subsidizing the economies of the 16 member ECOWAS for over 30 years, yet what have we gained? Successive administrations (dictators and democratically elected) have ensured the promotion of cooperation with other ECOWAS members States in all fields of human endeavour including cultural exchanges, what have we benefited from this? We’ve had the Ghanaian government ban Nigerian movies, an I legal act under the ECOWAS Treaty. Some have gone as far as outright seizure of Nigerian movies, Just in a bid to discourage the sale of Nigerian movies in Ghana and the government did nothing. This coming from a country that has Nigeria as its largest foreign investor speaks volume. Nigerian students studying in Ghanaian universities at subject to organised and unfair extortion. Anywhere a conflict surfaces in West Africa ECOWAS Security Chatter, ECOWAS sacred cow, which requires ECOWAS members to intervene militarily is invoked and Nigeria is immediately looked upon to spend her resources in bringing about a resolution. Just recently Nigeria spent $300 million in resolving the Gambia crises. But when it comes to upholding that Chatter which requires ECOWAS to stand behind Nigeria diplomatically and militarily, ECOWAS is absent. History has shown that when Nigeria comes other diplomatic and economic attacks by an external global power, the member States has in most instance rally support against Nigeria. Its happened with CAF, it’s happened with failure to back Nigeria’s rejection for a U.S military base in the region. when U.S President Barack Obama in his first trip to Africa flew over Nigeria to Ghana. He was given a welcome befitting of Kings. The was Obama giving Nigeria the middle finger. 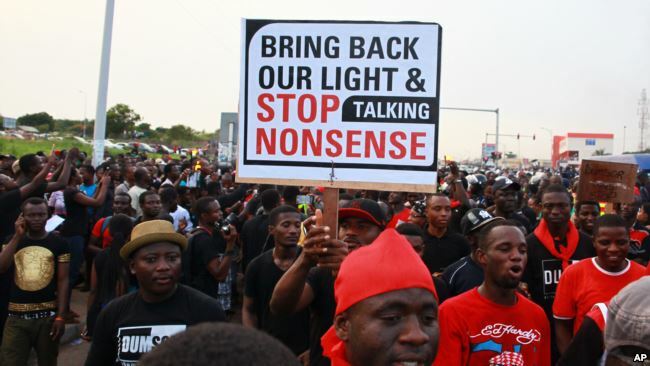 Just last year in June when power blackouts hit Anglophone West Africa’s second most powerful country -Ghana, the Ghanaian president publicly blamed “Saboteurs from Nigeria’s oil rich Niger Delta, sparking anti Nigeria protests across the country. He refused to tell his people who the pipeline company stopped supplying to Ghana a month before because it owed Nigeria’s gas company $180 million. An anti- Nigeria protest in Accra. The fact that the Ghanaian president would publicly blame Nigeria is indicative of the fact that no matter what Nigeria does, our neighbours will sell us out on a whim if the price is right. Since the Boko Haram crises picked up steam in 2009 not once has any English-speaking member state taken steps to support Nigeria. Nigeria was battling Niger Delta militants in 2003 when she sent forced to Liberia to protect the country’s fragile democracy. Despite Nigeria’s war weariness and economic crises on a scale not seen in 30 years Nigeria spent a whooping $300 million dollars to bring about a resolution to the Gambian electoral crises. What has Nigeria benefited from this? The powers that be have sought for so long to diminish Nigeria’s strategic importance using the same countries that rely on Nigeria for its economic survival. The sad thing is ECOWAS countries have developed a built in dependence culture and a sense of entitlement to Nigeria’s military and economic aid. Because they assume that come what may Nigeria will alwAys fulfill its big brother role by coming to their defence. They have studied Nigeria’s leadership over the years and have have a clever bit subterfuge to wriggle Nigeria’s power, all they need do is hold an ECOWAS to lavish praise on Nigeria for its leadership role and the GBAM !, the government will bring out the cheque book. This is as shortsighted as it is dangerous . They refuse to take into account the fact that soon the old guard intellectual midgets that has piloted the affairs of Nigeria for decades will soon be replaced by young and capable Nigerians. The more these countries play on Nigeria’s benevolence and ally with external powers against Nigeria’s interest, the more Nigeria’s sense of collective economic and military solidarity to ECOWAS will weaken. The inexorable outcome will be the demise of ECOWAS. If ECOWAS falls, if they lose access to Nigeria’s consumer market, the puny and weak member states will not survive. Previous Post Previous post:Hank Cohen gives a pragmatic assessment of Nigeria’s military capability. Next Post Five Weapons of War Nigeria’s Enemies Should Fear.